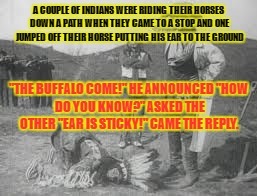 A COUPLE OF INDIANS WERE RIDING THEIR HORSES DOWN A PATH WHEN THEY CAME TO A STOP AND ONE JUMPED OFF THEIR HORSE PUTTING HIS EAR TO THE GROUND; "THE BUFFALO COME!" HE ANNOUNCED "HOW DO YOU KNOW?" ASKED THE OTHER "EAR IS STICKY!" CAME THE REPLY.